We will meet you at Maun airport and transfer you into camp. Options on transfers are available, helicopter transfer is highly recommended. Flying into the delta is a special experience and the view from the helicopter is the finest way to start you safari. 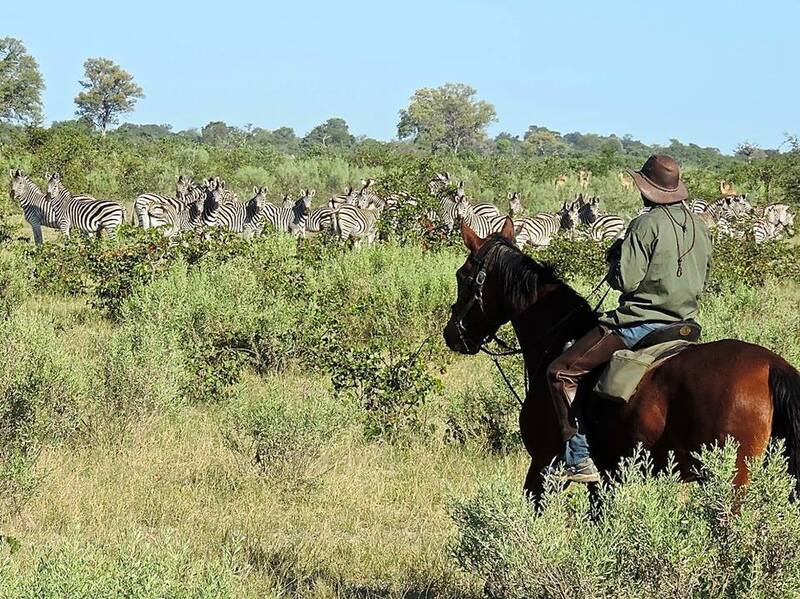 We serve lunch and given an introduction talk on safety and game viewing from horseback. This is followed by an orientation ride lasting 1-2 hours. Morning game ride in the Xudum area. Wade through lush green malapos that lead you from island to island. Surprise a timid reedbuck out of its dense cover on a heavily wooded island; enjoy herds of lechwe and giraffes moving through the open spaces. This area forms seasonal marshlands and hosts a variety of exceptional birdlife. Return to camp for lunch and a siesta followed by an afternoon game drive with sunset drinks and an evening drive. Ride from Kujwana to Mokolwane Camp, following a 30-km north-westerly route through open floodplains and scattered islands to the Matsebe River system. A picnic lunch is served on a shady island some two hours from Mokolwane Camp, where you’ll arrive at sunset. A morning Game Walk/Mokoro gives you the chance to explore the surroundings and experience the delta from a different perspective. After lunch and a siesta an evening ride takes you into the Matsibe River system and features wide floodplains interspersed with mokolwane palms – a favorite food of elephants and baboons, while the numerous Buffalo prefer the dense Tsaro Palms. A full-day from Moklowane to Kujwana riding the Southern route following the edge of the Matsibi River. A picnic lunch is prepared at the swimming hole. Enjoy a siesta on a camp bed in the shade of big tree and you could be joined by an elephant Bull strolling past or the sudden arrival of a herd of buffalo drifting into the water. Arrival at Kujwana is at sunset. Early morning game ride out on Kujwana Camp if flight times permit. Guests depart after breakfast. 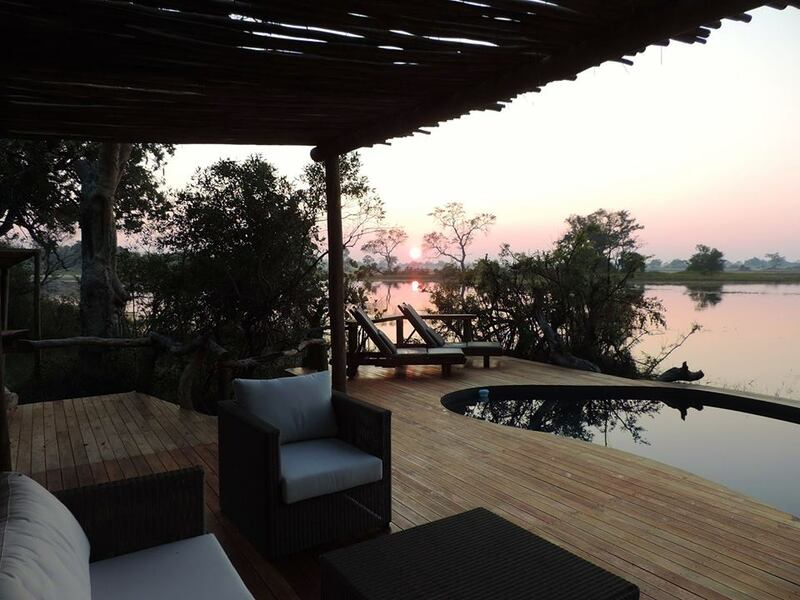 Kujwana camp is situated on the Xudum river south west of Chiefs Island in the Okavango Delta. The camp accommodates a maximum of 8 guests in spacious safari tents each with bathrooms en-suite. Fixed departure dates are published with a 5, 7 and 10 night safari offering the opportunity to explore the three main river systems in this area, the Xudum, Matsebi and the Kiri River. An area of over 2500 sq. km it is rich in wildlife and variety of fauna and flora. The areas between the three rivers contrast greatly and support different species of game and birds. Mokolwane camp is north west of Kujwana on the Matsebi River. This camp is situated in the open flood plains, which receive floodwater 3 weeks earlier than Kujwana camp. The vegetation consists of smaller palm islands and wide-open spaces. Mokolwane is also an 8-bedded camp. The tree houses (accommodation) are 10 feet off the ground boasting superb views, each with private bathroom.